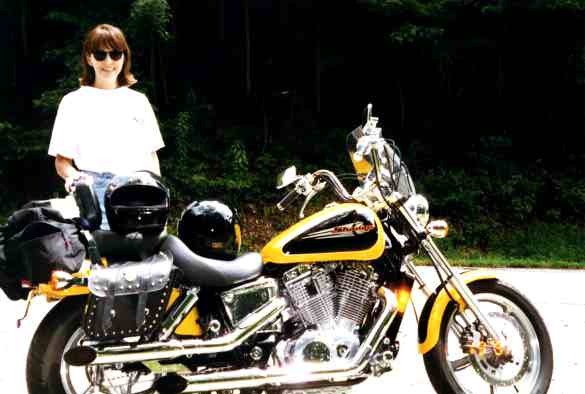 Here is a photo of Linda with the bike on a trip last summer to Unicoi State Park in Ga.
Its a 97' Spirit. Looks like a huge bumble bee. (yellow/black) I ordered the rest of the parts today. I'll have about $1500 in accessories when they arrive. The light bar instructions said they could be installed in just a few minutes. (it took 4 1/2 hours) I hope the rest of the parts are easier! I had a photo of me by the bike in the same spot but my wife takes a much better picture as you can imagine. I worked all day yesterday installing the balance of my accessories. the total is $1,139 now I think. I would buy more but theres not much more to add that I want. I thought about freeway bars but I need to see some really good photos from different angles or better yet in person to make that decision. Very soon after purchasing my bike I came across your web site. It cought my eye because it is dedicated to the best darned motorcycle out there.... The Shadow!!!!! I have put many hours into her and I see so few modified Spirits out there because people dont know where to find the parts or are unwilling or unable to pay the ungodly prices at the local Honda shops. Much assistance and nuts & bolts from my great friend and Harley rider "CHIEF"
A quick note to all those Spirit riders out there. There are parts for your bike out there if you take time to look. Or e-mail me at swells@vvm.com or logdog@biker.com for more info on where to aquire some of the stuff your dealer says is just not out there. Or for modification tips for your Spirit. I was looking around on the web for a windshield to put on my bike, and ran across the Shadow home page. Here's another picture from a proud Shadow owner to put in the gallery. My 97' Shadow Spirit 1100 is so new that I don't actually have the pictures of myself on it back yet, but my sister Darkwind looks pretty good up there, eh? Thanks for a great Shadow site (your links have been especially useful). Didn't see any Shadow clubs in the Southern CA (Riverside / San Bernardino) area listed, though. Would love to hear from any local fellow riders.